Now that the dust has settled on the South Dakota State embarrassment for Nebraska — if that’s what you can call a win — it’s time to get back to reality. Nebraska played poorly against the Jackrabbits because it wasn’t exactly easy to get motivated for that game, and it’s the main reason NU should scrap any thought of playing another I-AA opponent down the road — and especially right before conference play. For those Husker fans who aren’t convinced this Nebraska team is for real — that the 56-21 win at Washington didn’t mean much because it came against a weak Husky team — get over it. Nebraska played a near-complete game, on the road in a hostile environment, with a freshman quarterback making his first road start, and on television. It took pretty much all of 2009 for NU to accomplish a similar feat. What happened against SDSU showed a frustrating lack of focus on Nebraska’s part, but if anything it sets NU up nicely for its first conference game Thursday at Kansas State. It was the slap in the face Nebraska needed, and let’s face it, the season really starts now. Every conference game matters. Some fans won’t be happy unless Nebraska blows out stronger opponents. If that has become the standard for success in Lincoln, then there will be a lot of disappointment in the years to come. The college football landscape isn’t what it was when Nebraska last won the national championship in 1997, and it’s unfair to this current team to start making comparisons to what was one of the best teams in college football history. Pelini has set a standard of perfection at Nebraska, and that includes playing lights out on the road. NU is built for the road with what has become one of the best running games in the country. That’s not going to change because of the letdown against SDSU. The key matchup in Manhattan is Nebraska’s defense versus the KSU offense. You get the feel that NU’s defensive line is tired of hearing about how it has given up 100-yard rushing to teams it should have shut down. And honestly, Nebraska’s defensive line has played fairly well in 2010, but not anywhere close to the level of the 2009 unit. Coaches can say all they want about KSU’s ‘balance’ on offense, but there is no balance. It really is all about running back Daniel Thomas — everything starts and stops with him. Quarterback Carson Coffman is easily one of the slowest signal callers in college football and it’s not as if the Wildcats have a lot of options at receiver either. As we saw in Lincoln last year Nebraska will win if it keeps Thomas from making big plays, and is able to run effectively on offense itself. Of all teams, Central Florida was able to control the clock running right at the KSU defense — so the Nebraska offensive line should be drooling. Though Nebraska’s Taylor Martinez was held in check by SDSU, coaches say his performance really had more to do with his decision making. In that game he clearly tried to take what was a struggling offense on his shoulders in trying to make the big plays. So Nebraska left a lot of yards on the field that day in lost opportunities for Roy Helu and Rex Burkhead. It would be a complete shock if the Nebraska offense plays that poorly in successive games. Chances are good Nebraska will try to do much more in the passing game this week, as KSU will no doubt stack the line of scrimmage to try to slow the Nebraska running game. Martinez will take a few shots downfield early in this game and loosen up what has been a pretty bad run defense at KSU. The Wildcats aren’t good enough to consistently stop the Nebraska offense. All bets are off, of course, if NU lays an egg again this week — leaves the want-to at home. Don’t count on it. I think this is a game where Martinez takes a big step in his decision making. He’ll make fewer mistakes and the whole offense will take on a much different look this week. You’ll recall last year in Lincoln Nebraska pulled out a 17-3 win on the strength of its defense. That was in the middle of that horrendous struggle by the offense. 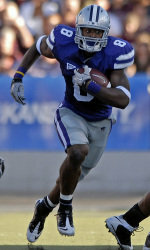 This year it will come down to which team has the most playmakers, and KSU falls far short.